This past winter did not have many really cold days, with temperatures below minus 10 degrees; but it was stormy, with a lot of snow, slush and freezing rain. Probably we will get more of the same as the climate warms — more days in the 20s and fewer of those chilly nights with temperatures below minus 20 that were more common in Vermont winters a few decades ago. Climate models predict winters with increased precipitation in New England. The main reason is simple: Warmer air holds more water vapor. At warmer temperatures, we get more wet heavy snow, rather than the light powder that falls when temperatures are cold. Now spring green-up is here, and the earth is coming back to life. Garlic is sprouting like a weed in my garden. My seedlings are up, and soon I will be able to put the frost-hardy ones like broccoli outside. I just planted lettuce and snap peas, as they can take cold nights. Once the ground melts, the roots of plants can take up water and nutrients. Peas sprout, and trees resume their growth as leaves burst open. Leaves take in carbon dioxide and make carbohydrates (food stores) in the process we call photosynthesis. Leaves are green because photosynthesis uses the red part of the light spectrum from the sun; the unused green light is reflected. The process returns oxygen and water vapor to the air. This is of huge importance to the planet, as well as for us. All winter over the northern continents, plants and photosynthesis are dormant. To stay alive through the winter, plants take in oxygen to convert food stores into energy and give off carbon dioxide, just as we do. 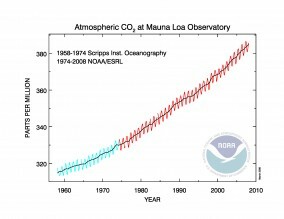 So during the northern winter, carbon dioxide rises and oxygen falls (just a little!) in the atmosphere. But with the return of new growth in the spring and through the summer, plants replace carbon dioxide with oxygen in the atmosphere, and the balance is almost restored. Actually we are very fortunate because plants, forests and the oceans are removing about half of the carbon dioxide we humans are producing. But we are burning so much fossil fuel that the rest is just steadily accumulating. The upward trend isn't smooth. The earth has good and bad years, with more or less growth in the tropics. And sometimes, when regions are dry, large forest fires put lots of carbon dioxide back into the air. So where are we headed? If we continue on our present path, rapidly burning our fossil reserves of oil, natural gas and particularly coal (the Earth has large stores of coal), carbon dioxide in the air will double and triple as it climbs back to the values it had perhaps 50 or 100 million years ago. The Earth was a very different place then, long before humanity. Have we thought carefully where we are going? So plant your flowers and vegetables; we need food and beauty. But go further into the woods and fields and reflect deeply on this web of life that bursts forth every spring to restore the balance of our atmosphere and climate. How much do you value and appreciate it?